Chanteuse et mandoliniste Bluegrass US originaire de Byrdstown (Tennessee). 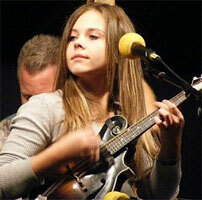 A child prodigy by any definition, Sierra Hull began playing mandolin when she was eight years old after being given one as a gift by her grandmother, and a year later she started playing guitar as well. Born and raised in the small rural community of Byrdstown, TN, Hull was soon playing jam sessions with other musicians in her family, and by 2001 she was entering local talent contests. Mentored and befriended by Alison Krauss, herself once a child prodigy on the fiddle, Hull was soon astounding and delighting audiences on the bluegrass festival circuit with her inventive and fluid playing style. After self-releasing a CD, Angel Mountain, in 2002, Hull signed with Rounder Records when she was 13 years old, and the label wisely chose to let her develop at her own rate. A year later at 14 Hull had begun to sing on-stage as well, and her voice featured the same sort of refreshing clarity as her mandolin playing. Hull continued touring with her band, Sierra Hull & Highway 111, which included her brother Cody Hull on guitar, Cory Walker on banjo and Dobro, and John Fox on bass. Two years later in 2008, Hull saw Rounder issue a proper debut album, Secrets, which was co-produced by Krauss and Ron Block. The 19-year-old prodigy authored seven of the 12 songs on her 2011 sophomore release, Daybreak.